4 states have passed acts this past November to end gerrymandering. This is incredibly encouraging, as gerrymandering ensures that our votes are meaningless. As long as gerrymandering exists we do not have representative government and cannot say we live in a democracy. That is not just my opinion, it is a fact. What is gerrymandering and why should we care? The cartoon above depicts the original Gerrymandered district: Elbridge Gerry was governor of Massachusetts in 1812, and he gets credit for it. 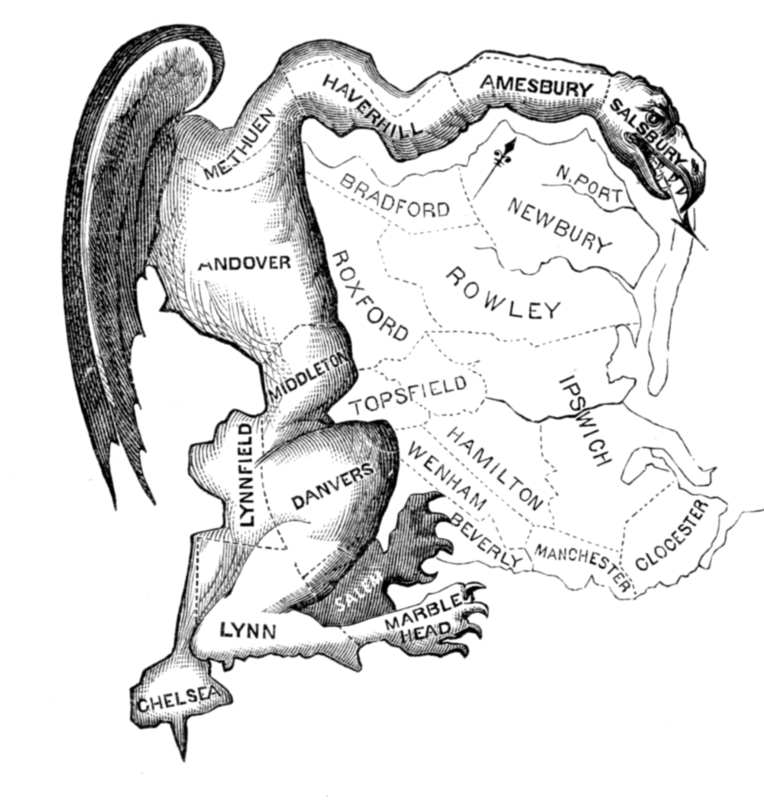 The local press—seeing a resemblance to a fantastic creature in the district he created — dubbed it the Gerrymander. The name now refers to any district lines drawn in a similar convoluted way… a way designed to ensure that one party always wins, even if they are in the minority. 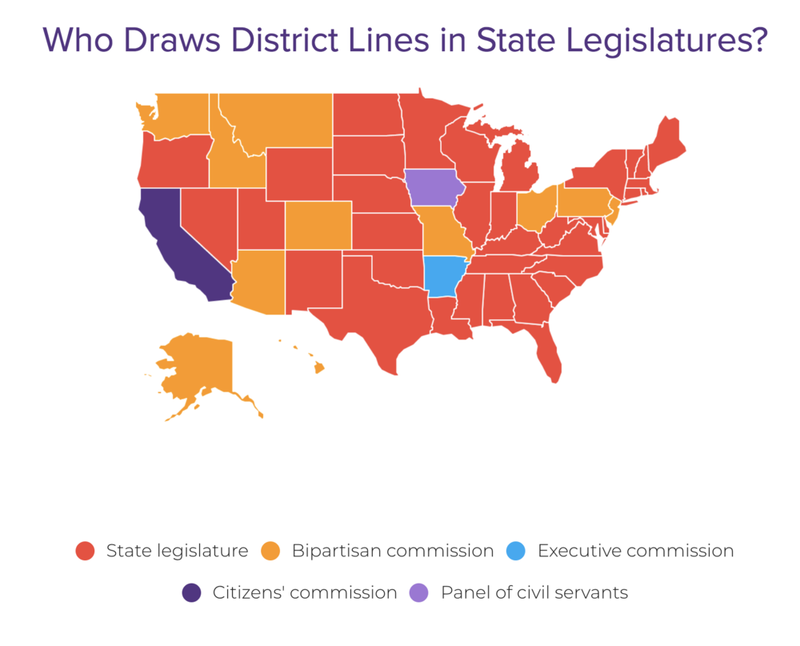 Political parties have taken advantage of this when they are in power and have, at present, the right to redraw district lines in many states. It has been used to disenfranchise Black American voters — as if it hasn’t already been hard enough for them to register! Politicians may seem pretty dumb at times, but boy they sure figured this one out. The example on the right above contains examples of the two main techniques that gerrymandering use: “cracking” and “packing”—breaking apart opposition voters and creating artificially unified voter blocs. In 2003, at the urging of then-House Majority Leader DeLay (R Texas), the Texas state legislature redrew the state’s political map, redrawing 32 districts! But to be fair, democrats have done this too. The districting has been determined predominantly by state legislature rather than citizen committees or non-partisan commissions. (FairVote)… but that’s about to change! Local organizations and voters have had enough of this and as a result of their efforts a significant numbers of states offered voters an opportunity this past November to end gerrymandering. States rather than the federal government are doing this because three times the supreme court has passed on taking up cases to end partisan gerrymandering. Voters clearly want this change to happen. As a result 4 states passed acts this past November that will affect this situation. Change is coming. 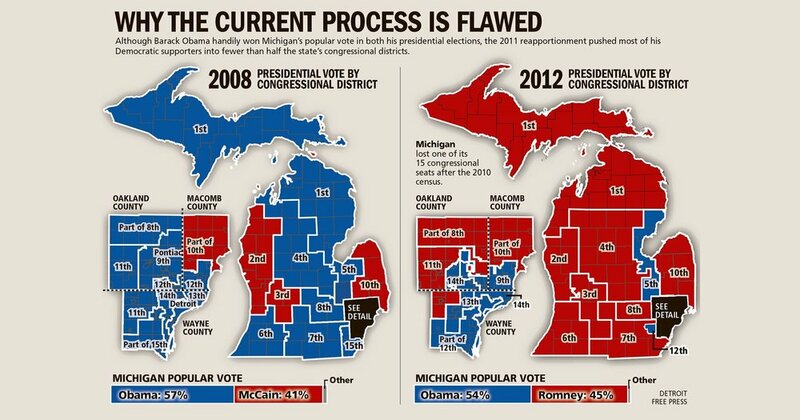 Illustration of Michigan’s presidential votes by congressional district, highlighting how the loss of congressional district decisions carry affect the voting outcome more than popular vote (Detroit Free Press). In Michigan, they voted in November on a proposed constitutional amendment promoted by a nonpartisan group called Voters Not Politicians. In Missouri, a nonpartisan group called Clean Missouri needed 180,000 signatures to get its anti-gerrymander initiative on the ballot; it collected 346,000. The voters successfully and overwhelmingly passed the Clean Missouri amendment. The act requires legislative records to be open to the public, requires policies to wait two years before becoming lobbyists, eliminates lobbying gifts more than $5, limits influence of major donors and uses nonpartisan, statistical model to draw districts. In Utah, a group called Better Boundaries collected 90,000 signatures to place the act on the ballot, 75,000 more than were required. But these changes faced resistance….it passed narrowly. Proposition 4 was approved by less than one percent of the vote. The proposition creates a seven-person commission that is made by appointment from both parties and would recommend new district borders. Utah state legislature still has final say over the district boundaries but would have to vote on commission recommendations. Along with the commission, there will also be limits on lawmakers’ ability to draw up districts, and the act creates requirements to minimize dividing counties, cities and towns. “The voice of the people will once again be heard in drawing legislative lines — making sure Utahns choose their representatives and not the other way around," former Democratic Salt Lake City Mayor Ralph Becker and Republican donor Jeff Wright said in a statement, adding that they "expect the voice of the people will be respected and honored." In Ohio, a reform act became law this past May… Ohioans approved the legislature’s version by a three-to-one margin. “It’s the best reform map we’ve seen in decades,” said Joshua Silver, the chief executive officer of the clean-government advocacy group Represent.Us, which has offered support to all four initiative campaigns. How can districts be drawn up fairly? How would that work? 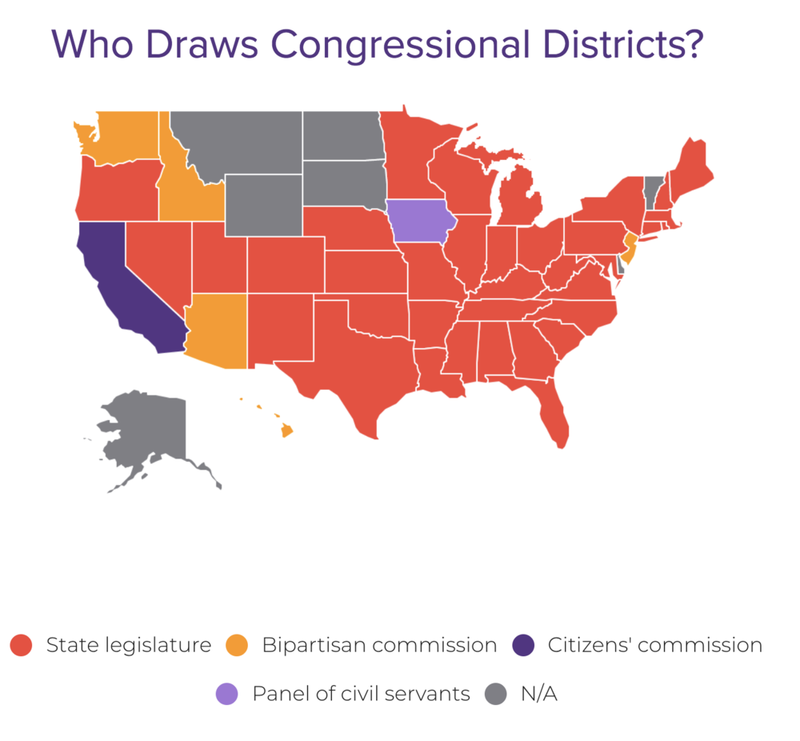 Most congressional experts agree on what a fair system would look like: It would limit redistricting to once a decade in order to reflect the latest population figures. It would place a priority on fostering competitiveness, ensuring minority representation, creating geographically compact districts, and achieving a congressional delegation that reflects the state’s overall political balance. The Garden State already has a bipartisan redistricting commission equally divided between the two parties. It is chaired by an impartial tiebreaker—historically, a professor from Rutgers or Princeton University. It almost works, but partisan folks still found a way to hack it. States do have the right to decide on redistricting on their own, but a national consensus would fix the problem once and for all. The reason the supreme court passed on dealing with the issue is they weren’t convinced there existed a solution. But Paul Smith, a supreme court litigator, thinks he has an answer. Smith believes they have found the right standard. A historical analysis of elections across from the country since 1972 suggests that an efficiency gap of 7 percent will entrench the majority party’s power at least until new maps are drawn. Wisconsin’s Republican-drawn gerrymander has an efficiency gap of 13 percent, meaning a huge number of Wisconsinites are currently deprived of their representational rights solely because they are Democrats. The court has long held that the Constitution enshrines the principle of “one person, one vote,” meaning districts should contain about the same number of people so that no vote counts more or less than others. This formula alone doesn’t make a solution, but it is a non partisan means of providing proof that a district is gerrymandered and proves a solution is really working. So, congratulations Ohio, Michigan, Missouri and Utah for taking a big step to bring representative government to the USA. It seems others will soon follow and they now have the means to correct this ridiculous situation and begin to bring representative government to the USA. Common Cause in Washington D.C.